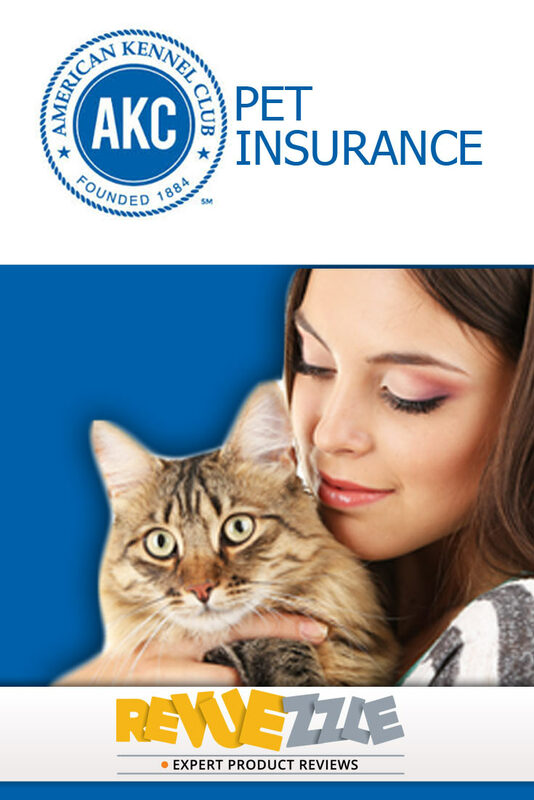 Perfect for owners that want to customize their insurance just for their pets specific needs. AKC Pet Insurance is the official insurance of the American Kennel Club and are able to provide insurance through PetPartners Inc. PetPartners was originally designed to exclusively provide insurance to the Kennel Club of Great Britain, but in 2002 it came to the United States and is now the only insurance provider of the AKC. They offer two basic plans that have flexible payment options, as well as optional add-on plans that further increase the coverage they provide. AKC pet insurance is ideal for owners who want to be able to customize their deductible and payout limits to best fit their needs. AKC pet insurance offers 2 main plans that are referred to as “CompanionSelect” and “CompanionPlus”. “CompanionSelect” is an accident only plan that is specifically designed for pets 9 years and older. It covers accidents, surgery, hospitalization, and medications. It has a per incident limit of $3,000, and an annual limit of $11,000, with a deductible of $100. Depending on the age of your pet you will pay between $30-$60/month for a dog, and $20-$50/month for a cat. “CompanionPlus” is an accident and illness plan that covers the same things as “CompanionSelect”, plus treatments of illnesses such as cancer, allergies, and cherry eye. This plan is very customizable, and you can choose the deductible amount, the per incident limit, and the annual limit as well. Deductibles range from $100-$1000, incident limits from $1,500-$8,000, and annual limits from $3,000-$16,000. Due to how customizable the plan is the monthly premium can vary greatly. So depending on your deductible and limits you can expect to pay between $30-$60/month for a dog, and $20-$40/month for a cat. AKC differs from many other providers by imposing both a per incident limit and an annual limit on payouts, with no option for an unlimited plan for either. The per incident limits are for the life-time of your pet. If you end up with a sick pet you may find that you end up paying much more out of pocket with AKC than you would with another provider. After enrollment there is a 3 day waiting period for accidents and a 14 day waiting period for illness. Cruciate ligament related conditions and hip dysplasia are both subject to a 180 day waiting period. AKC provides coverage to any licensed veterinarian in the United States and Canada. Like all pet insurance companies, pre-existing conditions are not covered. Other exclusions include breeding costs, cosmetic care, alternative therapy, acupuncture, and chiropractic care. Additional things such as hereditary and congenital conditions, spaying/neutering, and dental care are only covered if you have one of the optional add-ons. If you are using the “CompanionSelect” plan then the only option for a deductible is $100. With the “CompanionPlus” plan, you are given the choice 9 different amounts ranging from $100-$1,000. To submit a claim with AKC you only have to fill out a 1 page form and fax, e-mail or mail it directly to them. Claims on average take around 14 days to be processed. Unfortunately, claims are reimbursed through check delivered by mail so it will take longer to get reimbursed than if they offered direct deposit. 80% is the only option that AKC offers for the reimbursement level. The “CompanionSelect” plan has an annual limit of $11,000 and per incident limit of $3,000. The “CompanionPlus” plan has annual limits from $3,000-$16,000 and per incident limits from $1,500-$8,000. The per incident limits last for your pets entire life, so if they have a recurring problem and reach the maximum incident payout then you will no longer be eligible for reimbursement. AKC insurance has 4 optional add-ons that you can use to increase your coverage. The first choice is the “ExamCare” add-on. This plan only costs $4.42/month and provides reimbursement for the costs of exam fees or diagnoses. It does not cover the cost of treating the problem though. The second choice is called “InheritedPlus”, which for $9/month hereditary and congenital diseases. The next choice is the “Defender” wellness add-on. For $16/month it covers things such as blood work, vaccinations, microchipping, and flea/tick prevention, up to a maximum $305. Finally there is the “DefenderPlus” add-on, which covers all of the same things as the previous wellness plan, plus spaying/neutering, and dental cleaning. It costs $26/month, and provides coverage up to $535. Enrolling with AKC is very easy. Click the “get a quote” button at the top of their page, fill in your pets details, choose your deductible and limits, and then set up your mailing address and pay. Customer service for AKC can be reached toll free at 1-866-725-2747 or by e-mail at help@petpartners.com. When reached out to through e-mail they responded in a quick manner with very helpful information. Pricing is based on breed, age, and geographic location, as well as the deductible, incident limit, and annual limit that you choose. CompanionPlus 2 year old female mixed breed dog from Minnesota, with a $250 deductible, 80% reimbursement level, $2,500 per incident deductible and $8,000 annual limit, will have a monthly premium of $30. CompanionPlus 2 year old female domestic short-haired cat from Minnesota, with a $200 deductible, 80% reimbursement level, $2,500 per incident limit, and $8,000 annual limit will have a monthly premium of $24.42/month. 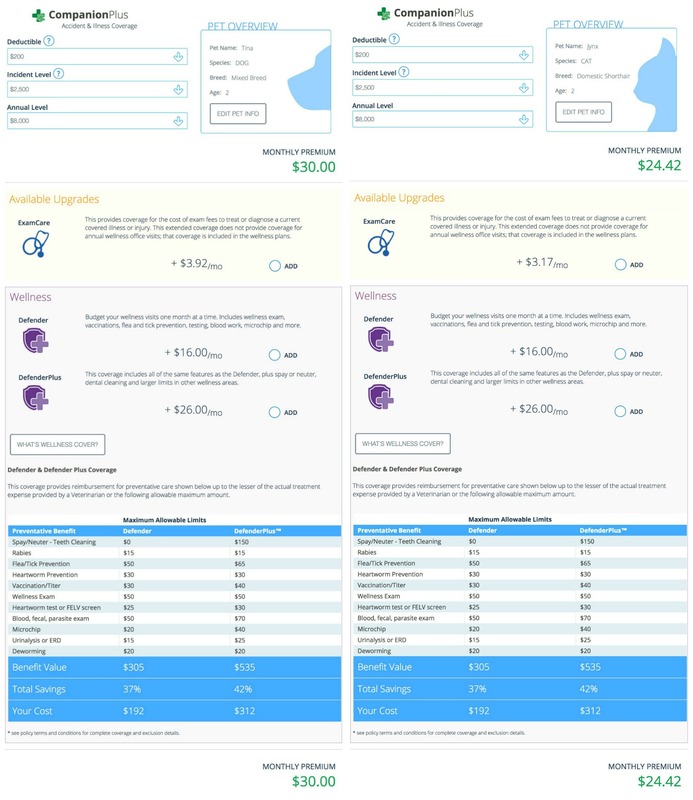 AKC will reimburse actual veterinary costs, unless they feel the costs are too high for your location – then they will payout based on reasonable and customary charges for your area. We want to clarify that with AKC there are no long term “contracts”. You can cancel at any time and receive a pro-rated refund for your last month – including if your pet passes away. With AKC you have the choice of paying your premiums on a monthly or annual basis. Paying premiums annually can save you up to $48 each year. Plans are available for cats 10 weeks and older, and for dogs 8 weeks and older. There is no upper age limit on enrollment, however if your dog or cat is enrolled after their 9th birthday then they will be ineligible for illness coverage. There are 2 optional wellness add-ons with differing per incident limits. Defender costs $16/month and pays out up to $305 annually. Defender Plus costs $26/month and pays out up to $535 annually. CompanionPlus pays out for Accident and Injuries for animals enrolled before the age or 9 years. CompanionSelect is accident only and is the only option for pets 9 years and older on enrollment. $100, $125, $150, $175, $200, $225, $250, $500, $1,000. Premiums will not increase as a result of filing claims. The “CompanionPlus” plan has a per incident limits of $1,500, $2,000, $2,500, $3,000, $5,000, and $8.000. Annual limits of $3,000 to $16,000. The “CompanionSelect” plan has the option of per incident limits ranging from $3,000, and an annual limit of $11,000. AKC does not provide special coverage such as alternative therapy, acupuncture, or chiropractic care. They also do not cover prescription foods even if prescribed by a veterinarian, or Behavioral Issues. Who is This Insurance Plan Ideal For? AKC pet insurance is best suited for pet owners who want to be able to choose the exact issues their pet is covered for and exactly how much they pay. The 4 add-ons offered by AKC, “ExamCare”, “InheritedPlus” , “Defender”, and “DefenderPlus”, all offer good additional coverage for a competitive price. Combining these with your main plan will make sure that you and your pet are protected from nearly every injury or illness there is. AKC offers more options for your deductible and limits than any other pet insurance company. Since these amounts have such a big impact on your premium it is very helpful in letting you choose exactly how much you want to pay. AKC offers customers a 30 day money back guarantee if they change their mind or do not like the service. This helps to show that they are more concerned with you and your pet’s well-being than simply making another sale. Both of the main plans have limits on the reimbursement provided for each incident. While other pet insurance companies reset these limit each year, AKC’s limit is for your pet’s entire lifetime. Pets with chronic or reoccurring problems will quickly reach their limit and will no longer be eligible for coverage because of this. Despite providing many options for limits and deductibles, AKC does not give a choice for the reimbursement level. As such, the maximum that customers will be reimbursed is 80%, compared to other companies that offer 90% and even 100% reimbursement levels. Nowhere on AKC’s website is there mention of a monthly service fee until you reach the check-out page prior to paying for enrollment. However, this fee is waived if you choose to pay on an annual basis. In this instance AKC is putting their own convenience ahead of their customers, since some customers may prefer to pay on a monthly basis and should not be penalized for this. The American Kennel Club is a distinguished and experienced organization when it comes to the well-being of pets. Although they are relatively new to offering pet insurance, they still provide insurance plans that have a broad range of options that will fit the needs of most pet owners. Unfortunately, due to low per incident limits pets with chronic or reoccurring conditions should stay away, since they will quickly reach their lifetime incident limit. Even owners of healthy pets should be concerned about these limits, since they could easily be reached with only 1 expensive surgery. Overall, despite the large number of choices and strong add-on options offered by AKC, their low incident and annual limits prevent them from being a top rate provider of pet insurance. Ideal for those that want customized insurance. The American Kennel Club is a distinguished and experienced organization when it comes to the well-being of pets. Although they are relatively new to offering pet insurance, they still provide insurance plans that have a broad range of options that will fit the needs of most pet owners. For example a 2 year old mixed breed dog from Michigan, with a $250 deductible, 80% reimbursement level, and $10,000 annual limit, will have a monthly premium of $34 under the "CompanionPlus" plan. A 2 year old mixed breed cat from Michigan, with a $250 deductible, 80% reimbursement level, and $10,000 annual limit will have a monthly premium of $30/month with the "CompanionPlus" plan. Prices are given as examples based on the criteria listed. Please note that the price you are quoted may be different based on your pet's specific age, needs, and coverage. $27.00 Get Your Free Quote!